Each year, as many as twenty million Americans are diagnosed with clinical depression. Tens of millions more have low energy or feel unhappy and dissatisfied with their lives. And each year, American doctors write 189 million prescriptions for antidepressant drugs for these people. Dr. James Gordon, a Harvard Medical School-educated psychiatrist who founded and directs The Center for Mind-Body Medicine in Washington, D.C., has been helping his patients find their way out of the darkness of depression for the past forty years. He has worked with everyone from high-powered Washington politicians to Hurricane Katrina victims, from overstressed doctors, lawyers, and stay-at-home moms to orphans from war-ravaged Kosovo and Gaza. Each one of Dr. Gordon��s patients is unique, but all suffer from some level of depression, and none are getting relief from the antidepressant drugs their doctors keep prescribing or the psychotherapy they��ve been receiving. One of our country��s most distinguished psychiatrists and a pioneer in integrative medicine, Dr. Gordon believes that depression is not an end point, a disease over which we have no control. It is a sign that our lives are out of balance, that we��re stuck. It��s a wake-up call and the start of a journey that can help us become whole and happy, one that can change and transform our lives. 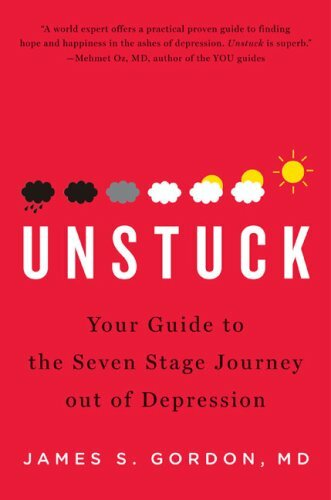 Unstuck is a practical, easy-to-use guide explaining the seven stages of Dr. Gordon��s approach and the steps we can take to exert control over our own lives and find hope and happiness. Unstuck is designed for anyone who is suffering from depression, from mild subclinical depression (��the blues��) to its severest forms. Jim Gordon's Unstuck is the first book I know of that gives away the store. To gain this insight in the past would have cost you years of therapy, drug testing and miserable years of life. In this book you get all of it summarized and explained in depth. By reading this book you can help yourself and avoid all the wasted time and visits to pill pushers. I'm almost sorry that I read this book. On one hand, the author really put together a fairly comprehensive and well-thought out set of treatment recommendations. I have no doubt that there would be tremendous benefit to the wholistic approach of yoga, meditation, social interaction, improved diet, and exercise, etc. in overcoming many instances of depression - but not all. In the depths of gloom and doom, it can be difficult, if not impossible, just to do something as trivial as brush your teeth or clean yourself in the morning let alone find the strength to self-motivate and begin - as well as sustain - a progam similar to the approach described above. The author further indicates that he typically obtains better results with a depressed patient after 10-12 weeks of therapy than he would have had the patient received anti-depressant treatment. I can't dispute his findings, but I do question them, particularly in acutely depressed patients. Of course, one of the main themes of the book is that anti-depressants are of little to no use, which is effectively throwing the baby out with the bathwater. It's just too extreme a reaction, in my opinion. While I agree that they are certainly wildly overprescribed, I just don't think anti-depressants are useless. Moreover, I do not share the author's view that most/all depression has no organic basis and therefore can be treated by wholistic methods alone. One treatment method in the book, for example, was some kind of cognitive therapy where the patient was taught to avoid 'self-defeating' thoughts. I call that the 'Cancel That Thought Therapy', or the 'Don't Think of an Elephant in the Room Therapy', and as far as I'm concerned, it's a pretty useless approach - at least that's been my experience. In summary, I do think that this book provides a ton of very good things that would enrich anyone's life. But in the case of seriously depressed people, I believe that anti-depressants may provide at least some kind of short-term intervention that wholistic methods alone (or together!) may not be able to. On balance, despite it's usefullness, I find it difficult to recommend this book unequivocally based on these criteria. decide what is right and wrong. James Gordon, MD, opens his new book with the following bold statement: "Depression is not a disease, the end point of a pathological process...It's a wake-up call and the start of a journey that can help us become whole and happy, a journey that can change and transform our lives." This may not sound like the typical perspective of a Western-trained psychiatrist, but Gordon is not your typical psychiatrist. He is a leader in the field of integrative medicine, having founded the Center for Mind-Body Medicine in Washington, DC, and served as the chairman on the White House Commission on Complementary and Alternative Medicine Policy. In Unstuck, Gordon provides a holistic and hopeful approach to living with and moving beyond depression. Yoga and meditation play an important role in his approach, but they are just two pieces in a surprisingly comprehensive guide to everything from antidepressant medications and Chinese herbs, to forgiveness and spirituality. Gordon presents depression as a hero's journey with seven stages: (1) The call, when you become aware that some kind of change or journey is needed; (2) Finding guides for your journey, which may include everything from a psychotherapist to a Yoga therapist (Gordon wisely suggests the reader search for such a guide through IAYT's online membership directory) to your own inner guide; (3) Surrender to change; (4) Dealing with demons, including negative thoughts, loneliness, and perfectionism; (5) The dark night of the soul, or dealing with despair and even suicidal thoughts; (6) Reconnecting to spirituality; and (7) The return to living every day with joy, courage, and conscious awareness. Although Gordon is not himself a Yoga therapist, he has studied Yoga and meditation, and much of his guidance reflects basic Yogic wisdom and some of the key principles of Yoga therapy and Ayurveda. For example, Gordon argues that the two first steps for healing depression are experiencing a sense of connection, and developing the capacity for compassionate self-awareness through meditation. Gordon goes on to explore the mind-body connection in both directions, looking at how thoughts and emotions influence the physical body, and how working with the physical body through Yoga, exercise, diet, and herbs can influence the symptoms of depression. He rejects the disease model of depression and argues that all challenges, including depression, can be the basis for self-understanding and well-being. Gordon also rejects universal claims that any one approach to healing will be appropriate for everyone. He emphasizes the importance of finding balance based on an individual's present condition, and paying attention to what is true for the individual. Gordon reminds the reader of this whether he is discussing the role of diet in depression, how to practice Yoga with awareness, or how to choose a psychotherapist. Unstuck is not a be-all, end-all prescriptive guide to healing depression. Instead, Gordon serves as kind of guide to the guides, using his professional experience and expertise to point out how the reader can develop a personal approach to healing. He does not pretend to be the world's leading expert on every healing path that he recommends readers explore. Instead, he provides an empowering and hopeful perspective that will help readers explore every aspect of their lives, and as many healing modalities as they find appealing. Gordon takes seriously his responsibility to help readers make one-on-one connections with professionals who can offer advice tailored to the individual. The chapter on how to choose specific guides to work with is compelling and noticeably absent in other "self-help" books. He emphasizes that any guide, whether a physician or a spiritual teacher, should know how to create a safe haven, and should be welcoming, generous, and courageous. Gordon himself models this approach in how he talks to the reader and shares his own experience with depression. A Great Alternative to Drugs! After being on Paxil for 12 years it is nice to find an alternative to the over prescribed antidepressants. I gained 80 lbs. over the past years, and I feel worse now that I look so bad. The whole body/mind/spirit approach is something that I can totally relate to. I am a trained clinican and researcher who now appreciates how little we really understand about the mechanism of hope and illness. Dr. Gordon makes a promise of providing hope at the very beginning of Unstuck. When I was diagnosed with a chronic, life-threatening illness, at Johns Hopkins University, I was so devastated, in pain, and hopeless that I turned to Dr. Jim Gordon, based on his reputation for alternative approaches to healing. To my surprise and relief, he told me that he could cure this illness, the only physician who made such a claim. He took me off my life-sustaining medication and put me on a diet of lettuce and yogurt. Under his intense care, I withered, my pain became excruciating, and I came very close to dying. After returning to my regular doctor, I settled into a productive and relatively healthy life. This is an excellent book; well structured, easy read, with a plan anyone can follow. Each section build on the other. He explains the why and wherefore and then give a Rx at the end of each chapter. This process can used by itself or,in connection with your peronal medical professionals. I particularly like the alternatives methods which he explains,in depth,so that a person can make their own informed choices. Personally, I am a vitamin and mineral advocate, but I know many who are quite pleased with herbal remedies. It takes courage to buck the system and I am thrilled to see MD's starting to open the door to alternative ways. I have worked in hospitals for years and have seen the other side of the drug industry. They do just as much harm as they do good,in my opinion, and I think it takes courage to stand up and lead the way to safer health care. As the Registered Nurse for a large Breast Care Center, I see about one-third of the women newly diagnosed with breast cancer in Sonoma County, California. I am recommending this book to many of my patients, plus some of my hundreds of patients in our Cardiovascular Health Assessment Program. You don't have to "be depressed" to benefit from "Unstuck." Dr. Jim Gordon's beautifully written book offers a model of simple practices yoked with profound insight for all of us during those inevitable times in our lives when we feel anxious, stressed, confused, conflicted or, yes, depressed. Dr. Gordon offers scientifically-sound and research-validated approaches combined in a way anyone can learn. If you seek to build on your own strengths, regain your sense of humor, mobilize your inner resiliency, restore your sense of meaning, and improve your mood and optimism about the future, look here. Everyone knows we "should relax", but, really, how can we do that at times when life feels difficult and chaotic? This work provides the EXPERIENCE of being able make a difference in our lives. If we learn we can quiet ourselves a little bit, that opens up the possibility that we can feel a little more peaceful, think a little more clearly, and begin to heal ourselves and our communities. Here is the model Dr. Gordon and people trained by him have used around the world -- with people facing chronic illness and cancer; the 52 children in the yellow school bus that careened to the edge of the collapsing Minneapolis bridge; survivors of Hurricane Katrina; 9/11 firefighters and their families; stressed out nurses and physicians; shell-shocked young breast feeding mothers in a war zone; victims of Apartheid; war-traumatized children; Palestinians and Israelis in groups together; orphaned girls; former prisoners; people who have lived through torture; child soldiers from Mozambique; professionals who care for traumatized populations; and now, soldiers and soon civilians with trauma from Iraq and Afghanistan. Dr. Jim Gordon is a highly-respected Harvard educated physician and clinical professor in the departments of psychiatry and family medicine at the Georgetown University School of Medicine in Washington D.C.
"Unstuck" is richly and authentically written. You can hear Jim's incredibly kind voice and generosity of spirit and compassion and open heartedness and the best of well-wishes for your well-being. Here in California with the wild fires raging, we ponder, "What would I take with me if a fire drew near." For me, Jim's book and the CDs from trainings with him would certainly be in my duffel. This book, written by a psychiatrist who himself has suffered from depression, will be controversial because it describes depression as "the beginning of an unfolding process of self-awareness, not the grim end of a disease process". The author challenges the prevailing model of depression as a medical illness, basing everything upon current brain research and current medical research dealing with depression. This is a very, very important book, one that every person who deals with depression should read. If you are looking for a quick and dirty way of dealing with depression and want to take medication only, and from then on never think about depression or your life again beyond renewing your prescription, you would do better by NOT buying this book. Recovery from depression does take some work. On the other hand, if you want to know more about current research with SSRI's and view medication as only a part of your approach to dealing with depression, you should DEFINITELY buy this book. If you are like me and wish that you didn't have to take medication at all, and are willing to do some work to recover, you should absolutely buy it---you will love it and benefit greatly from it as I have. If you want to know what research truly says about SSRI's it's here and more besides. Step-by-step techniques and tools. Examples that I could relate to. Integrating diet and exercise--what is shown to work and what doesn't. Supplementation. Support. Meditation. Movement. Awareness. Obstacles on your journey. Spirituality. There is a chapter on "the dark night of the soul", which includes dealing with suicidal thoughts. Alternative practitioners and alternative supplementation (including SamE, St. John's Wort, and rhodiola. There are huge appendices filled with resources to help you to find out more about every aspect of depression recovery. And of course, for clinicians and others, there are references to formal studies. "Unstuck" is a resource manual---a bible, even---for depression recovery. It is important for those who have depression and for those who love them and for others who want to know what experts now know about all of the approaches to depression recovery. Most if not all of the things Dr. Gordon recommends are excellent strategies not only for people who are mildly or moderately depressed (conditions that I think probably shouldn't be referred to as depression at all to avoid confusion), but for everyone else, too. However, for those who are seriously and severely disabled by depression, but who still have just enough energy to read, I think you can get a more complete and balanced view of the situation with some additional or alternative material. A good start would be reading the following articles by fellow depressive Therese Borchard (on the web - find through a search engine). "Don't Get Stuck on "Unstuck": Depression Is Real, and Drugs Help Me"
"The Latest on Antidepressants: Be Careful Where You Get Your Facts"
Then, especially if you've read "Unstuck," I think you'll have truly balanced and thorough basis to make a recovery plan for yourself if you read (or listen to as an audio book) "Against Depression" by Peter Kramer. A final caveat about Dr. Gordon's book: Several elements of his recommendations contain an underlying - sometimes subtle, sometimes not so much - suggestion that depression is fundamentally a character flaw, or something that can be eliminated simply through alterations in a defective worldview, etc. It's true that everyone needs to take as much responsibility as possible for their own lives. Needless to say it's also true that a symptom of depression is negative and unhealthy thinking. But for people who have major depression it's not helpful to frame the problem in ways that might lead to even more self-recrimination. In fact, I think that can make the problem and the consequences far worse. If you have serious depression, especially in repeat episodes, there is considerable science pointing toward a probability that you have a biological injury, not just a "weakness." So here's an analogy: If you have a bullet in your foot, it really doesn't matter whether you shot yourself or whether someone else shot you, or whether someone handed you the gun and encouraged you to do it, etc. The injury is the same, and you need to get serious help before you bleed to death. And if you have serious depression, get serious help before your life ticks away in confusion and despair. So the Gordon book may be helpful, or not, depending on you, your history, and your current situation. 'Unstuck' by Dr. James Gordon is an extraordinary, professionally written book with a contemporary & effective approach to healing depression. Although somewhat unconventional in technique the method for becoming unstuck from depression offers hope & happiness. The healing approach is holistic & integrative, and while Dr. Gordon is trained in Western medicine he also has ample direct experience working with patients who have experienced depression and trauma. Dr. Gordon is well educated also in Chinese medicine, Indian healing & Buddhist meditation. Ultimately Dr. Gordon's treatments involve body, mind, spirit techniques; so read this book to learn about the details on how to effectively heal depression. Reads well along with 'Nexus' by Morrison & Singh a spiritual & enlightenning novel about an interesting group of charcters in search of true happiness. Congrat. to the author. While the book may argue a bit too strongly against drugs to "cure' depression, this only minutely offsets the bs written in most books by shrinks who dispense SSRIs and so on like candy. I was given SSRIs a long time ago when they were fairly new to the market. Paxil to be precise. The word was that these wonder drugs had a rifle approach, limited side effects (i.e., one being you couldn't kill yourself with them), and were easy to get off. Then, with each successive year, the truth came out. Sexual side effects, sleep side effects, sweating, tremors, feeling a bit like a zombie, and so on. Not to mention possible suicidal ideations for both young and old! Then, there is withdrawal. "Oh, sorry, I guess there are severe withdrawal symptoms. Try tapering." "Brain zaps, that's normal." "SSRI syndrome" --- that can happen. These are extremely strong drugs. Extremely. And they do not have a rifle approach. "Listening to Prozac" was bs written by someone who must have profited from dispensing these powerful pills. Oh, and sometimes they don't work. Or work only slightly better than a placebo or exercise. In my opinion, money hungry drug companies and cheap insurance companies love these drugs. Rather than really help someone through, say, intensive talk therapy with a highly skilled professional, insurance companies prefer the pills because they are much cheaper. Even if severely depressed, most insurance polices will only entitle someone to one hour a week, possibly with an MSW who specializes in marriage counseling. It's pathetic. Enough gripping. This book is really needed. Paxil and so on are not meant to be taken permanently, yet many people are given permanent prescriptions. Moreover, they often stop working after a while. Prescribing more and more pills, at best, attacks the symptoms of depression, not the causes. But they are one arrow in the quiver and may be useful for some severely depressed people, especially on a short term basis (less than a year). That's my opinion. As well as that of many others who give up on the pills despite still being depressed. And resign themselves to a life of depression and misery becuase "the pills" don't work. This book may provide some help and perspective. My advice --- do your own research, listen to your body as well as your doctor and don't only rely on a pill doc. Also, go to a talk doc. These pills should be closer to a last resort rather than a first line of defense. Finally, don't over rely on these pills and plan on getting off of them if your depression lifts of its own accord.